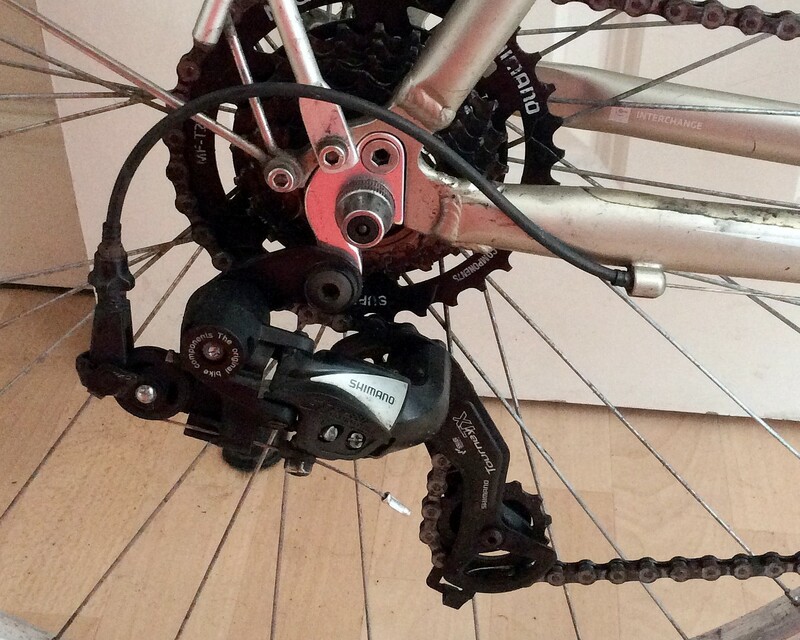 Shimano Tourney rear derailleur 34t support? I've just change the freewheel for a 34T and I also changed my rear derailleur for a Tourney 7sp (i run friction shifters). I would like to have a bit more distance between the cogs and the derailleur. But I cannot. What am I doing wrong? Or are there any trix? Using the 28T chainring doesn't move the top derailleur pulley any farther from the cog, so using a longer chain won't make any difference. It doesn't seem to cause any problems for me, though I don't use the 34T rear cog very often: it's too much of a jump in gear ratios from the next one down, which is a 24T. However, I don't have the same model of Tourney derailleur as you. Your derailleur looks like the RD-A070 and Shimano's compatibility listings indicate that this is only compatible with freewheels whose largest cog is a 28T. Try tweaking the B tension screw. It is very likely the big shiny silver combo pilips/flathead in your third picture. As you tighten the screw it should increase pressure on the internal spring. making the upper jockey wheel further forward. Slackening the screw a bit should relax the spring and allow the chain to pull it toward the back, and therefore further from the big cog. Get your bike up on a stand or hang it from some ropes and give it a try. You might be able to get some more clearance by replacing the top jockey wheel with a smaller one. Yours appears to be a 14 tooth in the picture. Jockey wheels are available from 10 tooth to 15 tooth. It's not completely solved yet but I think it will work now. I tightened the b tension screw as much as I could and now it doesn't touch the 34t cogs any more. I'll ride with it a month to see if it worked itself out or not. Thanks for all help and good suggestions! Update after 2 weeks: It seems to work fine. Not the answer you're looking for? Browse other questions tagged derailleur or ask your own question. 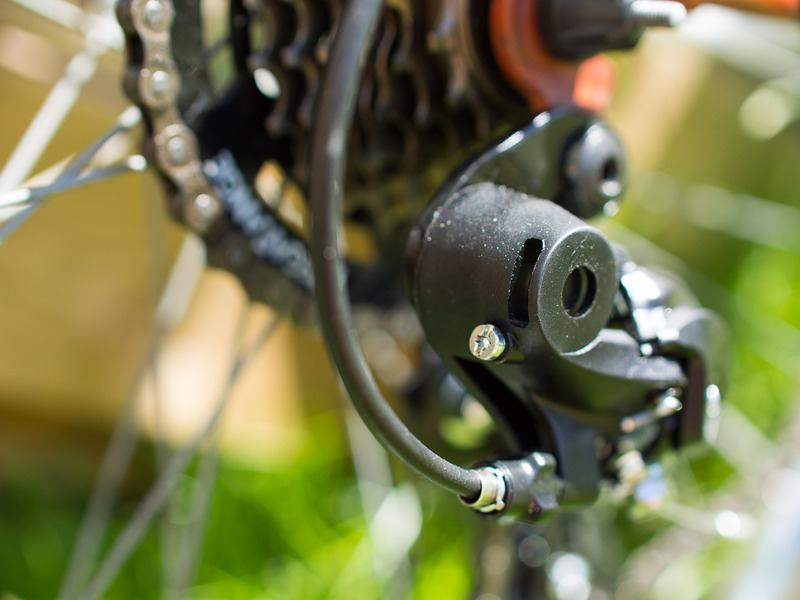 Short cage derailleur: how to find out maximum sprocket differences? Can I run a SRAM road rear derailleur with downtube shifters? Best rear derailleur for a Schwinn ranger? 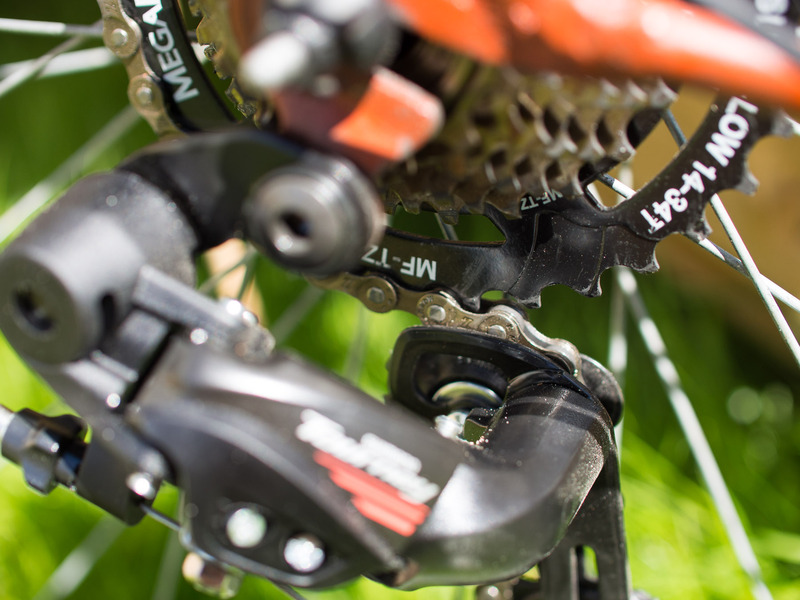 Will mountain bike front derailleur work with Shimano Tourney index shifter? 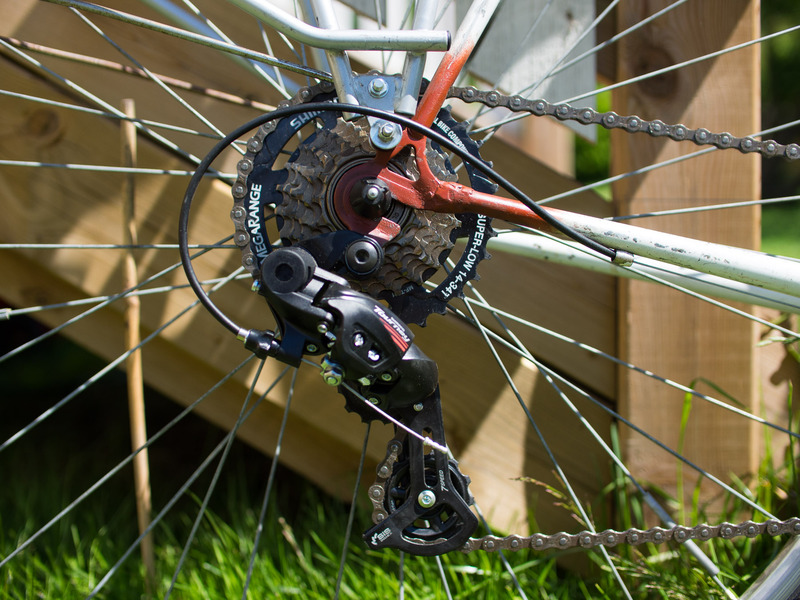 Run a Shimano STX derailleur with 8 speed cassette or bigger?